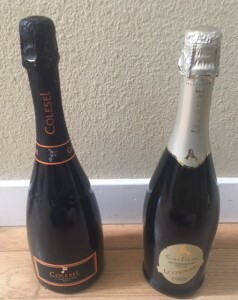 Prosecco is Italian sparkling wine made from the Glera grape. Prosecco gets is bubbles from secondary fermentation in a steel tank also called the Charmat method. To be classified as Prosecco a wine must be at least 85% Glera, the remaining 15% can be Pinot Blanco, Pinot Grigo, Perera, Verdiso or Bianchetta Trevigina. The Glera grape has high acidity and low alcohol and provides floral and fruity notes. Since 1919 the Franco family has been making Prosecco in the Valdobbiadene region of the Veneto. Their longevity has allowed them to build on experience history and tradition while developing new technologies to revolutionize Prosecco and create delicious bubbles, many at amazing values. 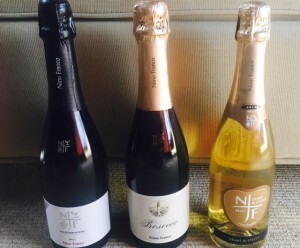 Nino Franco wine is a family affair and is very different from stereotypical “supermarket Prosecco” Nino Franco shows that Prosecco can be delicious elegant and accessible. By using old clones and new planting techniques and technology and collaborating with local producers Nino Franco will definitely make you reconsider any preconceived ideas you might have about Prosecco. The ConVal Consortium was created to protect, promote sustain and the safeguard the Conegliano Valdobbiadene area of origin. Con Val Prosecco are DOCG meaning Denominazione di Origine Controllata e Garantiti and come from a special area of Conegliano Valdobbiadene . DOCG is Italy’s highest appellation rating and a wine must meet certain specifications of quality to carry a DOCG rating. Within the Con Val DOCG, Rive Prosecco are from the slopes of the steep hills that are characteristic of the zone. For Rive, the Prosecco grapes must be hand harvested, the wine must be vintage dated, the grapes must be harvested at a maximum of 13 tons per hectare. Cartizze is located in Valadobbiadene is 300 meters high and is owned by 140 growers. Cartizze comes from the steepest hills and the best grapes of the appellation of San Pietro di Barbozza, Santo Stefano and Saccol and is considered the “Grand Cru” of Conegliano Valdobbiadene. 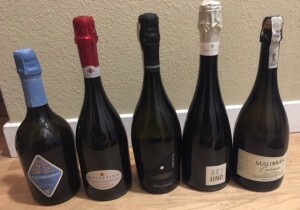 I look forward to learning and tasting more about Prosecco and hope to plan a trip to the region soon to brush up on my Italian and learn more about this region and its amazing sparkling wines in person! For more details about DOCG Prosecco check out http://www.prosecco.it/en/prosecco-superiore-docg/. Special thanks to #winestudio, Nino Franco & Con Val Prosecco for providing me the opportunity to taste and learn about these delicious Prosecco wines! This entry was posted on Friday, November 17th, 2017 at 7:50 am	and is filed under Uncategorized. You can follow any responses to this entry through the RSS 2.0 feed. You can skip to the end and leave a response. Pinging is currently not allowed.